Far Cry fans are no doubt looking forward to the release of the next instalment in the series, which is due on March 27. And hopefully Far Cry 5 will be a great entry in the long-running franchise after Far Cry Primal left some people with a bitter taste in their mouths back in 2016. It’s a great thing then, that the preview videos and trailers of Far Cry 5 we have seen to date have looked great, plus this is also the first game in the series to take place in a western setting – the US state of Montana no less. The game features several gameplay innovations like a resistance meter, and also does away with radio towers for the first time since Far Cry 3. This is also the first game in the series that lets you create your own character from scratch instead of having to play as a predetermined one (a great thing for those who hated earlier series’ protagonists such as Far Cry 3’s big-mouthed Jason Brody). 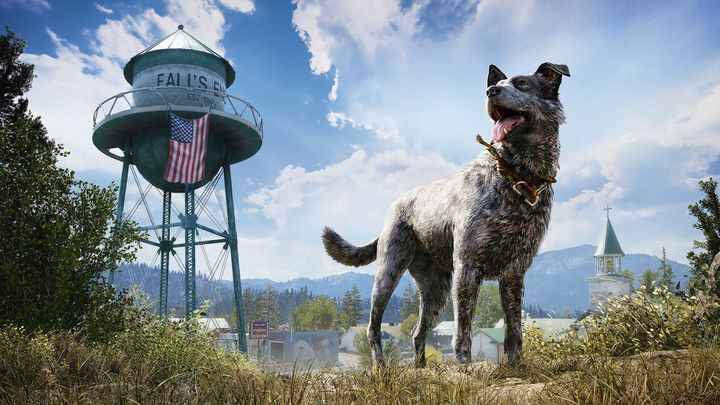 One aspect of Far Cry 5 which could make it rise above the earlier games is the fact that you have seven colourful companions who can tag along with you, including Boomer the dog. Ubisoft recently revealed more about Boomer in an IGN First video (see below), explaining why the Australian Shepherd will be such a great companion in the game. This is because Boomer will be a good choice for those who prefer a stealthy approach, as the loyal canine can scout your surroundings without fear of detection – enemies won’t know he is a threat (at least until it’s too late that is…). So, having Boomer walking ahead of you in Far Cry 5’s Montana, sniffing out enemies who might be lying ahead, could be a great advantage when going up against villain Joseph Seed and his evil cult. Of course, those who prefer to hang around with another companion or even trek through Montana alone also have that option, but what really matters is that Far Cry 5 ends up being as much fun to play as earlier entries in the series when it finally hits shelves next month.